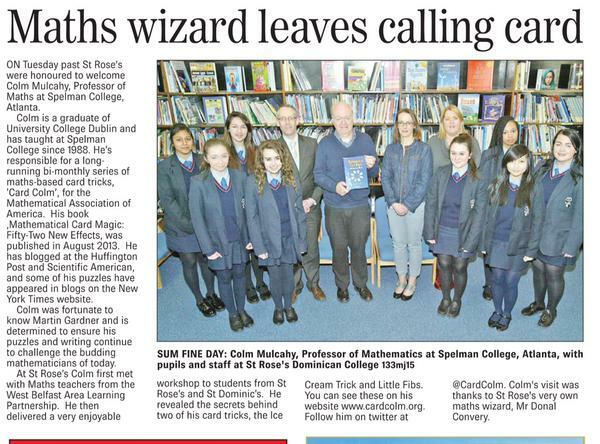 Colm Mulcahy is Professor of Mathematics at Spelman College, Atlanta, GA, where he has taught since 1988. He served as chair of the department 2003-06. He's always reachable on email. 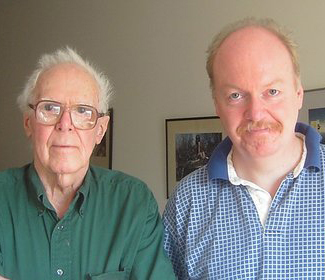 He is the creator and curator of the Annals of Irish Mathematics & Mathematicians (see overview, and the associated monthly blogs). Colm's musings (and puzzles and photos) have been featured at RTE, BBC, and NYT. He has been translated into Korean, Japanese, Mandarin, Cantonese, Polish, French, Spanish and Serbian. 1. (invited) "One, Two, Many (or a dozen reasons why mathematics isn’t as easy as 1,2,3)" - EPaDel MAA Section Meeting, Wilkes Barre PA (23 March 2019). 4. "Myles Awwy From Mathematics?" Palimpsests: Flann O'Brien, Dublin 2019 (16-19 Jul 2019). 5. 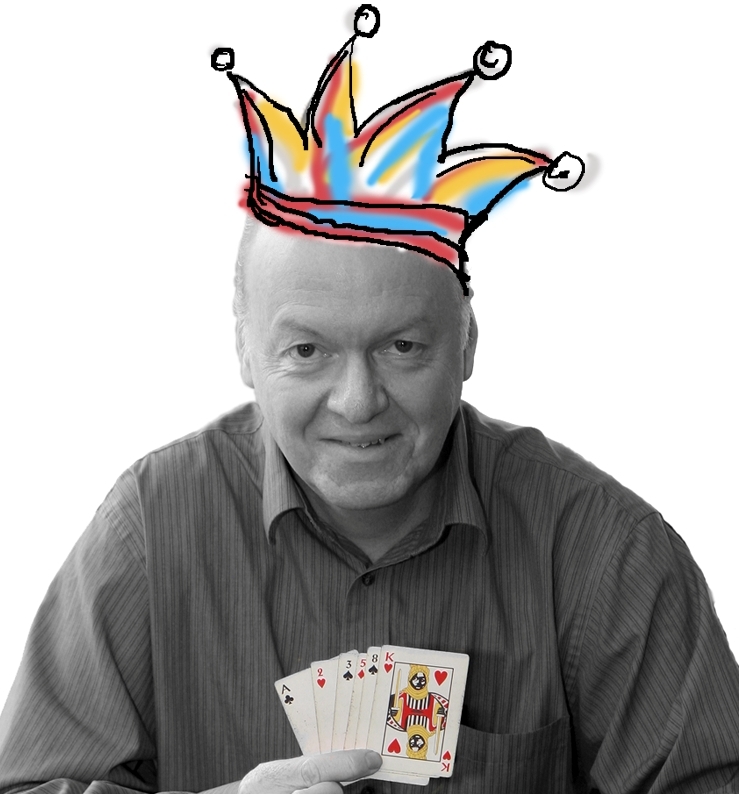 (minicourse) "Mathematical Card Magic" MAA MatfFest, Cincinnati, OH (Thu 2 August 3:40-5:40 & Fri 2 August 3:40-5:40 2019). 6. (pending acceptance) "Wait Wait Don't Tell Me" MOVES, NYC (August 2019). His Math Teachers Circle page has a wealth of resources. So does his Maths Week Ireland Oct 2017 page. Mad Math at Smith College Oct 2018 page. Card Colm's Highlands Maths Treats Jan 2018 page. 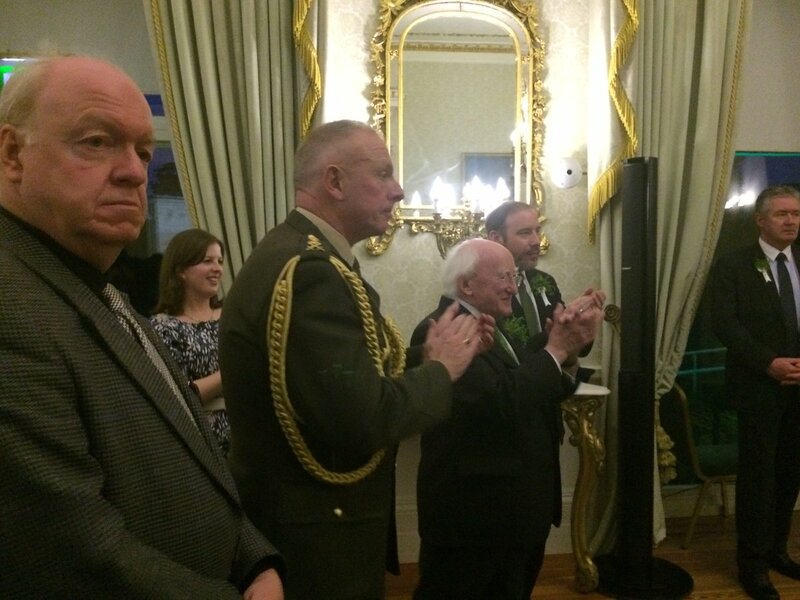 Irish President Michael D. Higgins hosts event to mark contribution of science, at which a team of innovative educators from CALMAST and Maths Week were honoured. A consequence of this collaboration is that Colm's Erdös number has been halved, from 4 to 2. South Gwinnett HS Celebration of Mind Tue 12 Dec 2017, 3-6pm. Intown Atlanta Math Teachers Circle meet-up Sun 29 Oct 2017 at Emory University. Celebration of Mind Sat 21 Oct 2017. 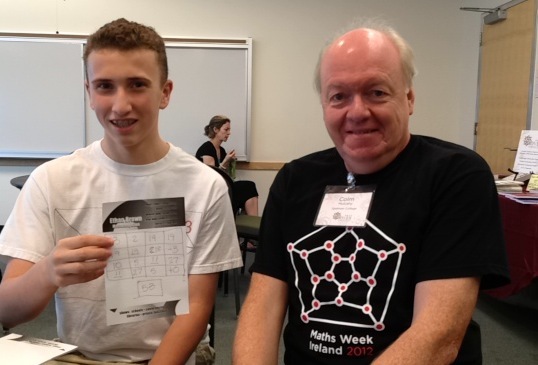 With Ethan Brown, in NYC, Aug 2013, at the first MOVES conference at the groundbreaking Museum of Math. Though he's only starting 9th grade, Ethan is already an energetic blogger, and a protégé of Art Benjamin. He's a total whiz at magic square completion and can do amazing mental arithmetic feats. 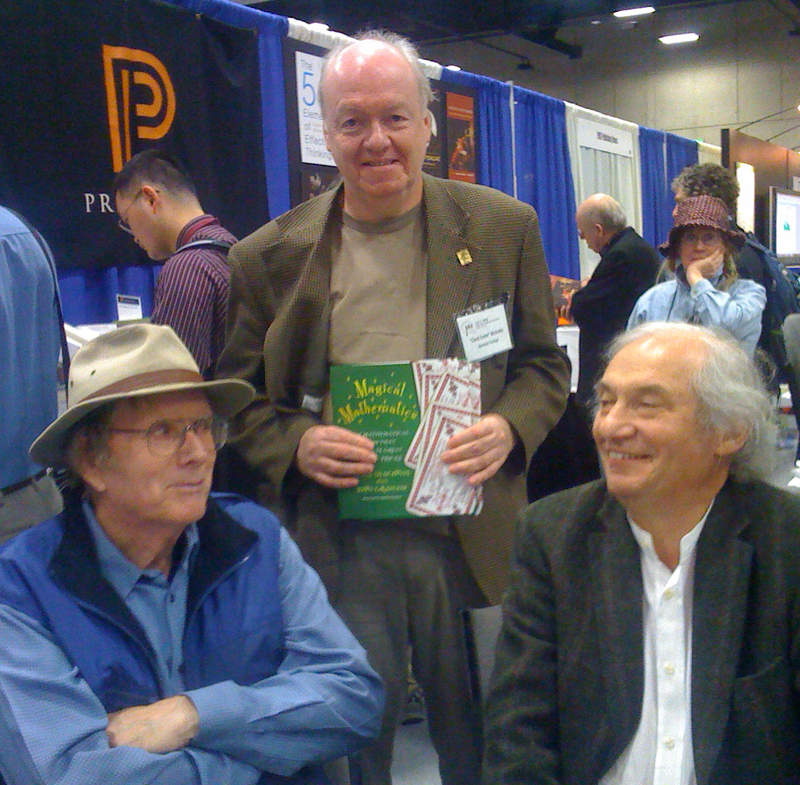 With Ron Graham and Persi Diaconis, in San Diego, Jan 2013, at a book signing for their beautiful and inspirational Magical Mathematics: The Mathematical Ideas that Animate Great Magic Tricks (Princeton University Press, 2011) deservedly won the 2013 2013 Euler Book Prize. 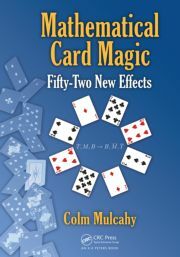 The wonderful mathematics and magic in that tome is much more sophisticated than that found in Mathematical Card Magic: Fifty-Two New Effects.